Amy LaDeroute is a singer, actress, voice over actress, sketch-writer and Expressive Arts Coach. Brimming with energy and enthusiasm, her large, exuberant and playful personality exudes warmth and charisma. She is often compared to the TV character Elaine on Seinfeld. Born for the stage, at 17, she landed a job as lead vocalist in a band playing throughout Canada and the US, for a career that spanned 14 years. She is the recipient of the 2003 North Carolina Arts Council Award for her vocal performance on her sacred CD, “Soul Affirmation” and has studied with John Davidson, Shields and Yarnell, Kenny Rogers, NY vocal coach Harold Garland and Florence Henderson. As a performing actress, she delights, captivates and holds her audiences in the palm of her hand with her hilarious and often quirky character renditions. She is recently back from Second City in Chicago where she immersed herself with improvisational and comedic sketch-writing. After writing several highly-acclaimed comedic sketches, she is currently working hard on her first full-length play. LaDeroute has leveraged her voice talents over the past two decades into a very successful career as a talented voice over actress for commercial broadcast. Extremely versatile, Amy’s voice can range from friendly and vibrant one instant to warm and authoritative in the next. Her voice is everywhere. She has trained corporate employees, sold baby clothing and beauty services, and convinced people not to drive drunk. Her listeners are drawn into another world with Amy’s audiobook narrations. 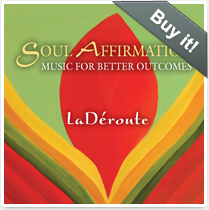 As an Expressive Arts Coach, LaDeroute coaches the inner voice out of you, until your soul finally sings the song you were meant to sing. A compassionate and empathetic listener, Amy inspires and supports you in finding your inner voice, truth and power. She teaches and motivates you to get out of your head and into your heart and body. She uses body movement and vocal exercises to help you feel your power, confidence and courage to finally come out of your shell, break out of your mold and find your long-lost hidden inner voice that’s been dying to come out. With her work as an Expressive Arts Coach, not only does she see her clients learn to express themselves vocally, but many clients go through deep levels of personal development and transformation by finally building the courage to identify and express their own true voice. Her warm spirit and joyful nature is contagious. If you’re lucky enough to meet her – she’ll lighten you up! Amy resides in Asheville, NC where she performs as a singer and actress, writes comedic sketches, blogs funny stories, works as a voice over artist and Expressive Arts Coach and loves hiking with her husband and dog Frito.